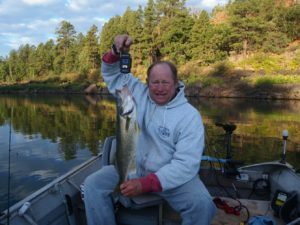 Paul L.: Show Low Lake is greatly underfished for walleyes. I have only seen a few fishermen during the summer fishing for them. Early morning and nighttime are best. At the same time your catching largemouth, smallmouth, trout, catfish and bluegill. So come on out to Show Low lake and enjoy the eagles and ospreys.